Just over a year ago, when I had to file for my disability, my husband and I became OINKS, One Income, “No Kids”. What I mean by “No kids” is, in our case, our kids (my four girls) are all grown and self sufficient. 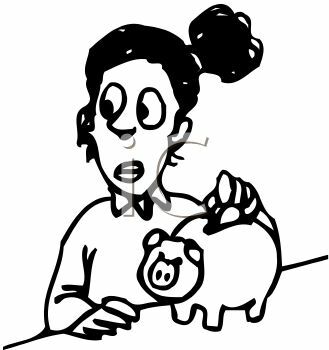 Going from DINKS (Double Income, “No Kids”), to OINKS meant even more money crunching than we were already trying to do. Besides being down to one income, my medical costs were getting worse (hence, when the question ‘where the money go’ pops up and your co pays for your medications are $200 and, in fact you quit taking some of them because you just cannot afford it, let the ones who question walk in your shoes). We did the obvious; move into town (lower living and gas costs), 10 minutes from Paul’s work, downsized to one car…. one reliable car (yes, this means a car note, but the car is not in the shop every other month with $200+ in repairs). Also, our car gets great gas mileage which means with our 30+ MPG (in town) along with our reward points we used through Kroger (sometimes getting up to seventy cents a gallon off! ), we really save in this most important time of all, fuel wise. Also car insurance is one car only! 1. We invested in cloth napkins (inexpensive, not fancy). I do a load of laundry nearly everyday, and even if I don’t, there are 12 napkins so plenty for 2 -3 days for Paul and I. If it is a holiday, I make sure they are all washed up. If there is a lot of people, I will splurge and buy paper, but I invested in 12 cloth and think they have already paid for themselves three times over! 2. Make your own ice! 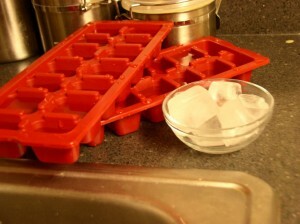 We invested in a couple of ice trays which were $1.10 a piece. Though I buy water bottled (but will be investing in a Brita pitcher this payday), I just pour the drinking water into the ice trays and keep them going throughout the day. It takes seconds and saves loads of money as well as natural resources. 3. Dryer Sheets! They make them too big! You do not need all that ‘power’ in one punch. I cut mine in half. I have rarely had any issue with cling. So if it says 80 sheets, you really get 160 and so on. Same with detergent; only use about 2/3 of what it calls for. They have you over use on purpose. I heard this on a talk show years ago but never acted on it. I decided to give it a try and our clothes come out just as clean and static free. 4. Scan the meat section/ whatever you buy ‘a lot of ‘/ staples for mark downs. Here is a good example. Paul and I like both ground turkey and ground chuck. We happened to come across two GIANT tubes of ground chuck that was still 3 days shy of its best by date. It was 1/2 price. So we got sixteen pounds of ground chuck for $16.oo. Obviously we split it out and froze it when we got home, however, we had enough hamburger for weeks! It felt like we hit the lottery! 5. Don’t over buy, especially produce! We used to throw things out and I hated it! We decided to shop two to three times a week, especially for produce. 8. Painful as it may be, you may have to have a “come to the river” meeting with yourself. I did and realized I was spending a lot of money on diet cola. So I decided, while one or two a day is OK, six is not so much. I have worked hard to get down to one or two a day and those that know me well should be proud of me! 😉 I now supplement with iced herbal tea and enjoy it very much! I will add more hints as I think of them!